When referring to broken records, athletes usually are gunning for another person’s best mark. However, that’s not the case on the Bordentown Regional High girls’ spring track and field team. The Scotties have two throwers who will be aiming to break their own school records. Senior Alicia Carthan and junior Kelly Yanucil each hold school records. Carthan holds the shot put record with a distance of 39 feet, 11 inches. Yanucil holds both the discus and javelin records with distances of 116 feet and 124-9 respectively. Second year head coach Bill Lloyd said he is impressed with the efforts of his two throwers and the example they set for the entire team. Yanucil placed 9th in the javelin at the MoC, but more importantly her performance qualified her for the Penn Relays. She was scheduled to compete April 26. She needed to throw 120 feet to qualify in the javelin, and instead broke the school record with a throw of 124-9. Carthan, a four-year letterwinner headed to Rider University in the fall, may not have qualified for the Penn Relays, but her accomplishments are still impressive. As a junior, Carthan placed second in the Central Jersey Group II sectionals and state Group II Championships in the shot put and placed third in the Central Jersey Group II sectionals in the discus behind the champion—her teammate Yanucil. Carthan has been working with her father, Larry Carthan, who is a former high school thrower and Division I football player. The pair has focused on improving her technique. The elder Carthan shot putted in the low 50s as a thrower for the Scotties in the late 1970s. Yanucil has also been a varsity letterwinner since her freshman year. Last year, as a sophomore, Yanucil captured the Central Jersey Group II Sectional Championship in the javelin and discus, and placed third and fourth in the NJSIAA Group II Championships in each event respectively. Lloyd said he thinks she has a good shot at winning the state title in the javelin this spring. To add to the load, Yanucil has decided to take up high jumping for the very first time this year, as well. She already has leapt to the top of the Scotties depth chart in the event. Yanucil has also added weight lifting to her training regiment, but has had to find a balance between strength and size since taking on the high jump. “It’s hard because I want to get stronger to become a better thrower, but at the same time, I have to watch how much size and mass I put on so I don’t adversely affect my high jump performance,” Yanucil said. Despite being fiercely competitive, Carthan and Yanucil use their intra-squad rivalry as a motivator to become better throwers and push each other. “I’ve known Kelly through sports since middle school and have played on several teams with her, including basketball, so we’re pretty cool,” Carthan said. 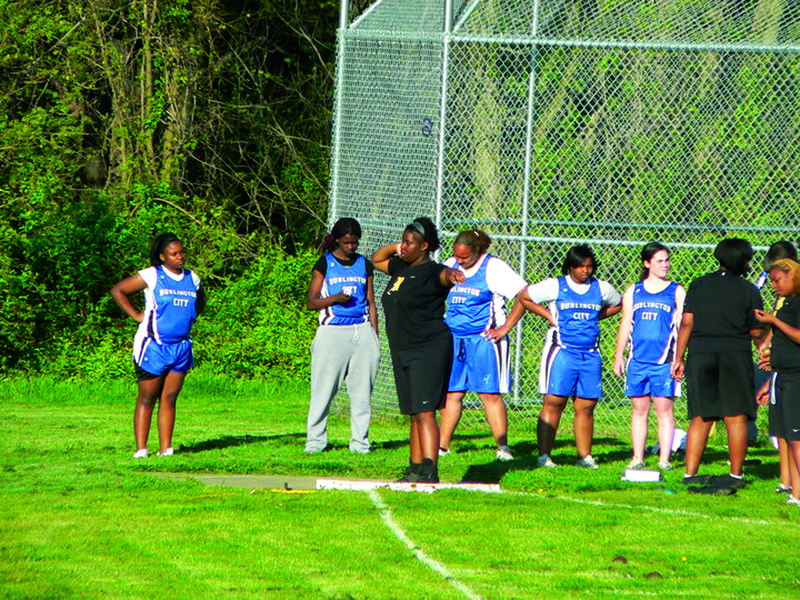 Both girls weren’t throwing their best early in the season, but they seemed to be happy with their progress. Carthan is coming off of surgery on her left foot for a fracture on her little toe, and is only at 75 percent. She said she doesn’t feel like it’s affecting her throwing. Yanucil was experiencing the same early season rust, but was primed for her appearance at the Penn Relays. After that, the Meet of Champions will be a little over a month away, on June 7. Both athletes are looking forward to improving on last year’s finishes. Yanucil similar aspirations heading into this season.